Bob Dunnett, director, Alistair Mackie, volunteer, and Bob Pountney, director, Morayvia Aerospace Centre, beside the fuselage of the Antonov AN-2, of which they recently took delivery. 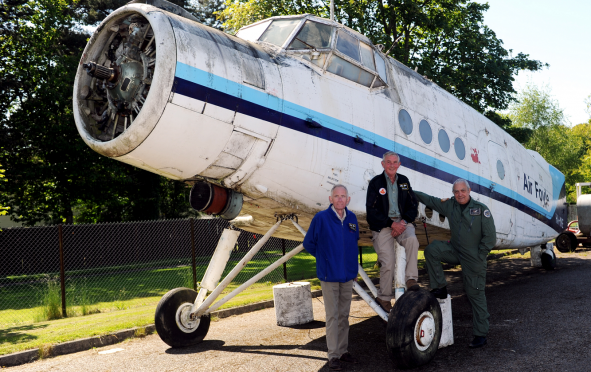 Kinloss aviation centre Morayvia has taken delivery of a Soviet Union Antonov 2 plane that dates back to the 1950s. The weathered fuselage is already at the group’s base with the wings expected to arrive separately this week. Stan Barber, chief executive of Morayvia, hopes the exhibit will give an added insight into the science of flying. He said: “We’re trying to collect complete aircraft now, particularly ones of interest to let people have a look inside and see a different side of flying. “The Antonov has slightly different instruments. It’s quite a basic design so it’s good to give an understanding of the science of flying, instead of thinking of it as magic. The aircraft was delivered to Morayvia by lorry from Hampshire and is the only one of its type in Scotland. The plane shows the effects of being left exposed to the elements for 10 years and will be restored by the group before going on public display. The tail has been detached and there is no propeller fixed to the front of it. Work on the Russian relic is expected to take a few months before it can be used as an educational tool at Morayvia. Mr Barber said: “It’s a single engine plane but it is really quite big. There could be 12 people in it when it started carrying passengers. “We want to show people the science behind it and explain that there is a clever base to it. Quite often there are trade-offs and compromises in design.